The 1976 film “Network” won four Academy Awards, including best original screenplay for writer Paddy Chayefsky, for its blistering portrayal of an American society fueled by greed and bloated on corruption. A haggard Peter Finch took the best actor trophy for his harrowing performance as Howard Beale, a TV newsman who is so disgusted by the state of his industry – and the world it reflects — that he threatens to commit suicide on the air. His mantra — “I’m mad as hell and I’m not going to take it anymore!” — both thrills and galvanizes viewers. Funny how times haven’t changed. 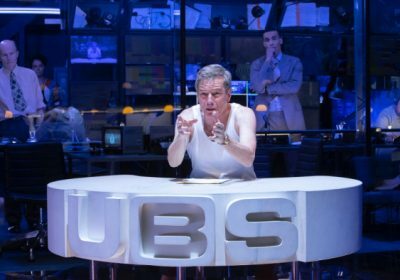 Chayefsky’s diatribe, which played as satire almost a half-century ago, takes on fresh fury in a sizzling stage production, directed by Ivo Van Hove, that feels less satiric but more urgent — and frightening — in today’s times. Adaptations have been made to the original screenplay by Lee Hall, but the sense of immediacy is palpable. Bryan Cranston, who could do no wrong as Walter White in “Breaking Bad” (and a Tony winner for “All the Way”), burrows deep under the skin of Howard Beale here: the furrowed brow, the anxious angularity, the searching eyes all indicate a person in extremis. But it’s the voice that really makes us feel — and fear — for Beale. Beneath the mellifluous tones of Cranston’s professional “newsman” delivery we can hear the agitated rasp and incipient howl of a person who’s cracking up. We first meet this man of his times — and ours — in the studio of his news show, “Tonight.” Meticulously designed by Jan Versweyveld with all the requisite bells and whistles of a TV newsroom, the set features a fully-functioning control room manned by the TV show’s director, production assistants and various distraught technicians. For all the agitated business going on in the control room, containing it within a plexiglass cube makes the crew look like inmates, surely a deliberate image. At the same time, Tal Yarden’s video-scape blasts us with vintage ads for soap powder, tacos, hair products and diarrhea pills. The set is so electrifyingly antsy, it’s hard to know where to look; but at the same time, it’s impossible to look away — which is, of course, the point of television. After delivering a sober newscast about the day’s bad news, Beale decompresses by getting drunk with his friend and the president of the network news division, Max Schumacher, played with good-humored authority by Tony Goldwyn. That’s when Beale suddenly tells his friend that the state of the nation has become so deplorable that he’s decided to commit suicide during his next nightly newscast. “I’m going to blow my brains out right on the air, right in the middle of the six o’clock news,” he announces. In Cranston’s masterful performance, the delivery of this line is so intriguingly ambiguous that we’re immediately riveted. Max’s flippant response — “You’ll get a hell of a rating, I’ll tell you that” — indicates that his colleague thinks it’s a joke. Except that Beale does, indeed, seem in a state of existential angst, and there’s something about the fire in Cranston’s eye that makes us wonder. Beale is in crisis because he has been trying and failing to look away from the very culture of television that is his bread and butter. He’s complicit in a crime he deplores. Tatiana Maslany, a critics’ darling and Emmy winner for her work on “Orphan Black,” is on different territory here as Diana Christensen, a ruthless producer who suggests a weekly show about real-life terrorists in action. Along with footage of actual hijackings, assassinations and massacres, the program would exploit the victims of these atrocities by parading them in “human interest stories” captured as they were reeling from their horrific experiences. The depth of Chayefsky’s cynicism is so breathtaking, so full of existential despair that it makes today’s critical pundits look like weepy whiners. And although Cranston never pushes Beale over the edge into madness, he brilliantly nudges him to the outer limits of anger where madness awaits. For a writer dealing with such a harrowing subject, Chayefsky proves himself to be morbidly funny, especially when Beale double-crosses the network executives who have allowed him to return to his show to resign with dignity. Instead of bowing out with good grace, he roars to life and demands that America join his crusade. “I just ran out of bullsh–,” he explains to a shocked nation. “Bullsh– is all the reasons we give for living.” And unless we want to go on fooling ourselves, Beale implies, we might as well speak the truth. Or possibly kill ourselves. It’s a free country. The chance to watch Cranston in full-throated flight is what sells tickets here. But once they’re in the theater, audiences will find that Beale’s anger now feels so palpably topical that, when Beale urges America to stand up for itself and send out a mighty roar of disapproval, it takes a lot of self-control to keep from jumping up and shouting along. Belasco Theater; 1,016 seats; $179 top. Opened Dec. 6, 2018. Reviewed Nov. 29. Running time: ONE HOUR, 55 MIN. Production:A presentation by David Binder, The National Theater, Patrick Myles, David Luff, Ros Povey & Lee Menzies, with Annapurna Blanshay-Yonover, CatWenJam Productions, Patrick Catullo, Delman-Whitney, Diana DiMenna, Falkenstein-Grant, Hagemann Rosenthal Associates, GHF Productions, The John Gore Organization, Harris Rubin Productions, Sharon Karmazin, Koenigsberg-Fan, Kors Le Pere Theatricals, Alexander “Sandy” Marshall, Stephanie McClelland, David Mirvish, Moellenberg-Hornos, R.H.M.-Jonathan Reinis, Catherine Schreiber, Ken Schur, Jayne Sherman, Cynthia Stroum, Tulchin Bartner Productions, Zeilinger Productions, and The Shubert Organization, in association with Dean Stolber, of The National Theater Production of a play in one act adapted by Lee Hall from the Paddy Chayefsky film. Creative:Directed by Ivo Van Hove. Sets & lighting, Jan Versweyveld; video, Tal Yarden; costumes, An D’Huys; sound & music, Eric Sleichim; production stage manager, Timothy R. Semon. Cast:Bryan Cranston, Tony Goldwyn, Tatiana Maslany, Joshua Boone, Alyssa Bresnahan, Ron Canada, Julian Elijah Martinez, Frank Wood, Nick Wyman, Frank Wood, Barzin Ahkavan, Jasin Babinsky, Camila Canó-Flavià, Eric Chayefsky, Gina Daniels, Nicholas Guest, Joe Paulik, Susannah Perkins, Victoria Sendra, Henry Stram, Bill Timoney, Joseph Varca, Nicole Villamil, Jeena Yi.